• Abel Seaman—Art! Art! Art! Many comedians and those who teach comedy seem to think you can’t go wrong aiming at the lowest common denominator. I don’t mind a sprinkling of piss and fart jokes (so to speak). But the shows I’ve seen most frequently fill a house are those that refer to traditional culture. Hannah Gadsby’s tours of the National Gallery of Victoria are always sold out. Ben McKenzie has done well with his Museum Comedy Tours. Abel Seaman attracted a healthy and appreciative crowd for their show Art! Art! Art!. Art!x3 is an evening of sketch dealing with fine art: creating, selling, and appreciating it. Art from the Renaissance to today is played with and roundly mocked. For those of you excited by Post-Modern narrative, this certainly has it— but I don’t think you could really avoid it when combining high art with hijinks. Martin Dunlop and Michael Teychenné nicely contrast with one another as performers. Teychenné’s light boyish charm is made funny by Dunlop’s dark broody intensity. They have clearly worked together long enough to give their character interactions a casual edginess. It would be fun to see them develop a single set of their characters and put them into a single extended story. Lano & Woodley are famous for this. Though, the Abel Seaman style is more Fry and Laurie. The majority of Dunlop and Teychenné’s sketches are clear hits. The art dealer trying to get an artist to jazz up his paintings of Jesus was uproariously funny. I will again complain that our sketch performers are not getting enough of a hand up with a venue dedicated to sketch comedy. What was lacking in Art! Art! Art! was skill in working with an audience. They needed to allow the audience their laughter. They need to give people a chance to applaud. Applause is not just for the performers’s benefit. People actually enjoy being able to actively register their approval and have that approval acknowledged. This isn’t television…this is much better! I have to say, I had a great time at Art! Art! Art! and would be happy to catch another Abel Seaman show next festival. 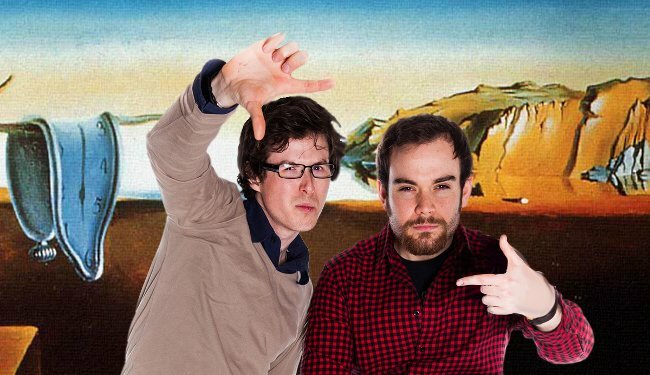 These guys are a comedy force to be reckoned with.